If it doesn’t say Montmorency tart cherry juice, grown in the U.S., it probably isn’t. If you watched the headlines last spring and summer, you are probably aware that the Michigan tart cherry crop, nearly all of which is the Montmorency variety of cherries, suffered a 90% loss this year. This resulted in an extremely short supply of U.S. grown tart cherries, and by extension, a shortage of tart cherries available for juice. Because we are tart cherry growers ourselves, we were aware of the impending crop failure early, and were able to get out in front of the curve to secure enough locally and regionally grown, USDA certified organic tart cherries for our Northport Organic tart cherry juice concentrate. Not everyone in the tart cherry juice business has been able to source Montmorency tart cherries for their products, and many have resorted to importing Morello sour cherries from overseas. We have noticed over the past several months that some retailers have been selling the imported Morello cherry juice without telling their customers of this important change to their product. We contacted a few online retailers ourselves, such as Dynamic Health and Swanson’s, and asked them if their tart cherry juice products were made from US grown Montmorency tart cherries. We were told they were using imported “tart cherries” of an unspecified variety. 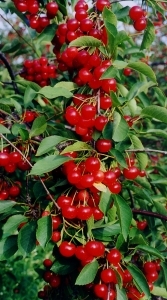 This most assuredly means they are not Montmorency, as European cherries are primarily Morello.